During our advocacy meetings this year we have intentionally established the opportunity to learn about our connections and interconnectedness to one another. We are one people and one earth! One recent presentation was by the Rev. Curtis Karns of the Yukon Presbytery. Rev. Karns gave us his background, passion and involvement in care for God’s environment. He lives with his wife in a bio-shelter home where they teach about and live the life they espouse. Rev. 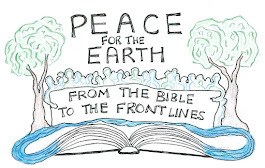 Karns started a Presbyterians for Earth Care group (YPEC) in the Yukon Presbytery after realizing, as they were locally experiencing the results of climate changing, the faith perspective was missing. Although no one congregation took up the faith connection to climate change, he identified many individuals within the presbytery representing several different churches, who did have the desire to bring theology into the discussions. They have acted to bring Earth Care concepts into the Yukon Presbytery working documents. Karns focused on two local concerns in his presentation – the effect of toxins on the Village of Savoonga and the effects of climate changes on polar ice and its consequences. The Village of Savoonga, located on the northern cost of St. Lawrence Island in the Bering Sea and where 95% of the population is indigenous, has been challenged since World War II. Because of its position in the Bering Sea, Savoonga was the site for war games and military maneuvers as well as a toxin dump for PCBs. Although it was part of a completed superfund cleanup, the sea mammals in the area have over 10 times the normal amount of PCBs in their bodies. The people of Savoonga rely heavily on sea mammals for food and the result is the toxics are transferring to humans through their diet. These peoples are also being affected by the winds blowing east from China and Southeast Asia. These winds are very acidic winds that blow in affecting the caribou on the lands resulting in unhealthy and reduce food sources for the villages. YPEC is working with the Alaskan Community Action of Toxins (ACAT) to address these concerns to the state, national and international governmental entities. Rev. Karns also recommended Dan O’Neil’s The Firecracker Boy’s to learn about the radioactive testing done off the coast of Alaska. Climate change has dramatically impacted these villages. The increased temperatures are rising at such an extent that it is now affecting the permafrost of the area. This results in the lack of build-up of the polar ice sheets that have historically provided a barrier to storm surges and protection for the local villages. Not anymore. Now the polar ice builds up late and indigenous villages are being damaged and destroyed. Peoples are losing their lively hoods and their homes. The latest study reports the U.S. climate has changed everywhere in the United States – we are connected with these Alaskan populations and are called to sustainably nurture and care for God’s creation. Check out the newestclimate assessment report and see how climate change is affecting your location. Creator God, open our eyes as we study together our interconnectedness. Help us recognize that all our actions affect all your creations. Guide us as we discern the care that is pleasing to thee in relation to all you have entrusted to us. May we honor your creation with all our words and deeds. Jo Randolph co-moderates the advocacy committee for PEC with Holly Hallman. She is a LEED Associate Professor teaching at the local community college, holds a Certificate in Environmental Ministry and Leadership from McCormick Theological Seminary, heads the Earth Care Team at Grace Covenant Presbyterian Church and is an active member of Heartland Presbytery Earthkeepers. In her spare time she enjoys her gardens, her grandchildren and experiencing God’s awesome creation. The time is truly NOW that we who love Creation must rise, reach out and reclaim a banner of urgency in caring for our Home. As climate change is upon us, there are many among us who are sensing the urgency of changing our overly consumptive ways. Many national and world leaders are crying out to be heard. Much of the media still prefers to cling to stories that distract us, such as the fate of the Malaysian jetliner. Yet we must hold our ground and be proactive in focusing discussion on how to tend the Garden with seeds of sustainability rather than with toxic chemicals leading to slow suffocation and destruction. The UN Intergovernmental Panel on Climate Change (IPPC) has a huge and hugely significant report on the effects of climate change, which is coming in geometric proportions, much faster than previously predicted. After years of very disappointing responses from leading countries such as the U.S. at international climate conferences, many responsible world leaders have researched and prepared a document verifying the disaster upon us. We who love Earth can feel her groaning under the effects of continued toxic effects of trying to extract more, pollute more, and call it progress. A new series, “Years of Living Dangerously,” is a set of 10 documentaries that explore the human impacts of climate change. One of many well-known concerned citizens highlighted is Katharine Hayhoe, PhD, an atmospheric scientist and evangelistic Christian, who PEC has previously been in contact with as a keynoter. Many people of faith including Presbyterians are hugely dedicated to working on healing the Earth and holding Earth sacred. Many have been heard at PEC conferences and many will be heard at General Assembly in Detroit this June. PEC continues to be a leader in the movement and is embracing those prophets who are working toward the true meaning of divestment from the fossil fuel industry. We are working also to hold up sustainable, responsible development and research in technology and production. We are grateful for Yukon Presbytery, who is sponsoring a young woman of indigenous heritage who will speak for the overture on the Precautionary Principle. PEC supports the overtures against coal export, the Overture on Food Sovereignty and against factory farming. Thanks to the extra effort of those presbyteries who concurred with these overtures in order to get them to GA. See these overtures on PC-BIZ. However, as important to get the information through the national level, it is the impact at the individual, congregational and community levels where we also must also focus. It is at the grass roots level that we need to feed, be fed, and become prophetic in calling for a return to more simple, beautiful, lifestyles and communities of caring, with responsible consumerism, living in gratitude to God, working to heal and hold sacred our Home. Amen.